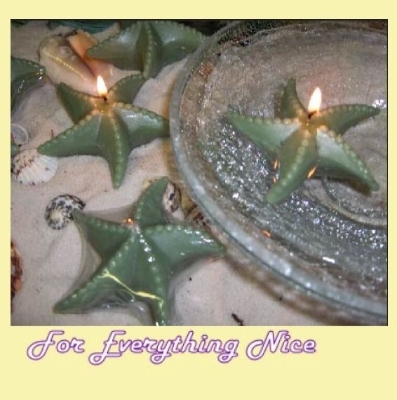 This set of three (3) scented Sage Green Starfish shaped Floating Candles has been beautifully made. Simple and Elegant. Lightly scented with a soothing fragrance oil. The floating candles are individually hand-wrapped and labelled. In addition, they make great center pieces when floating in a bowl of water and are sturdy enough to be lit on a dish or dry surface. These candles are made with non-lead wicks and highly refined paraffin wax specially blended with beeswax for stronger scent and longer burning time. Each and every candle is carefully hand poured for the highest quality. No harmful additvies added in any of these candles. 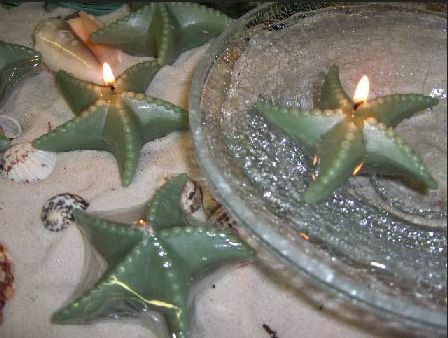 Each starfish measured 3.25 inches (8.25cm) in diameter x 1.00 inches (2.54cm) tall and burn up to 4 hours when dry. A little less time when in water. Please note: burn time depends on if you trim the wick and if you keep candles away from draft or wind and if you burn them on a dry dish or in water, or if you get the wick wet. For safety purposes, any candles should not burn no more than 3 hours at a time. This item is made in and shipped from the United States. Please be advised that your items take approximately 10 days to made before they can be sent to you. Combined postage is available for larger quantities - Please Ask !